A lot of times I haven’t shared things on this site because I’ve felt that they are too simple, too basic or that everyone should already know the information. Being able to attend the H.O.T. classes this year at FDIC gave me a bit of a reality check and reminded me what training is all about. While I was there I saw firefighters of all skill and exposure levels. Some were obviously well trained and had ample opportunity to practice their skills. Some were well trained but were rusty. Some had nothing. I started thinking about it and remembered that even though something may be common place to me or any number of you reading out there, there may be one or two who read this website which find the same information I present as brand new. And I guess you really never know who those one or two are. So, without further ado, I present to you; Hallway Sledge’s Hinge Hooks. I was frustrated with the limitations of typical wooden door wedges; being kicked or knocked out of place, sliding on smooth surfaces, being too short in certain instances etc. I began messing around in the shop one day with whatever was on-hand and this is what I eventually came up with. My system is cheap, is fast to make, can be made out of almost any kind of scrap wood, is mostly universal to man-doors, resists being accidentally displaced and can also be used on most garage doors as well. 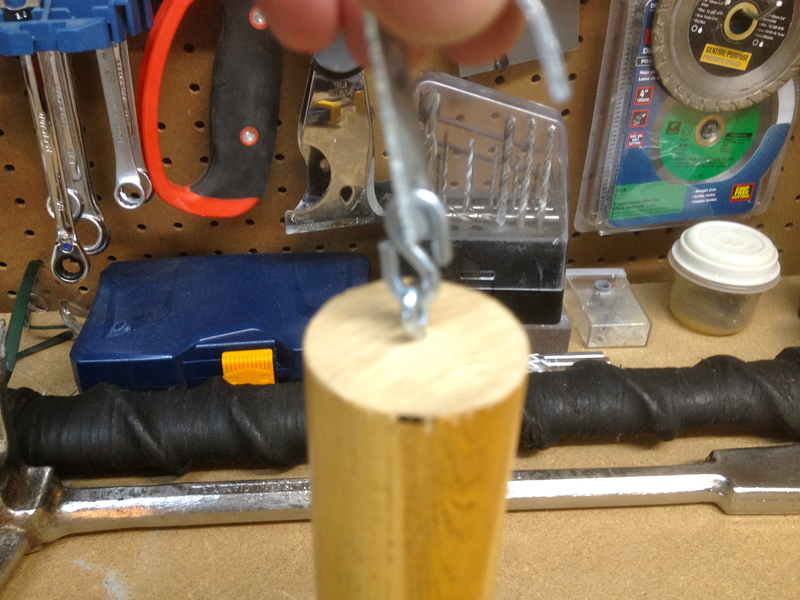 Here is a step-by-step guide to making my hinge hook. The first step is to gather your materials. I use scraps of wood from random projects or scavenged from dumpster diving, houses donated for training, wherever. 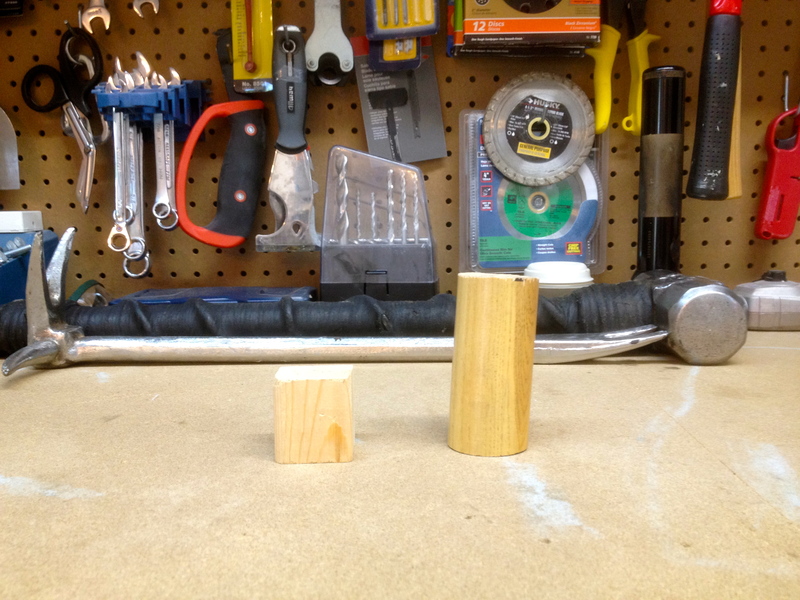 2- inch x 2-inch or 2-inch diameter nominal is fantastic but that usually means we get 1 1/2 inch for everything. 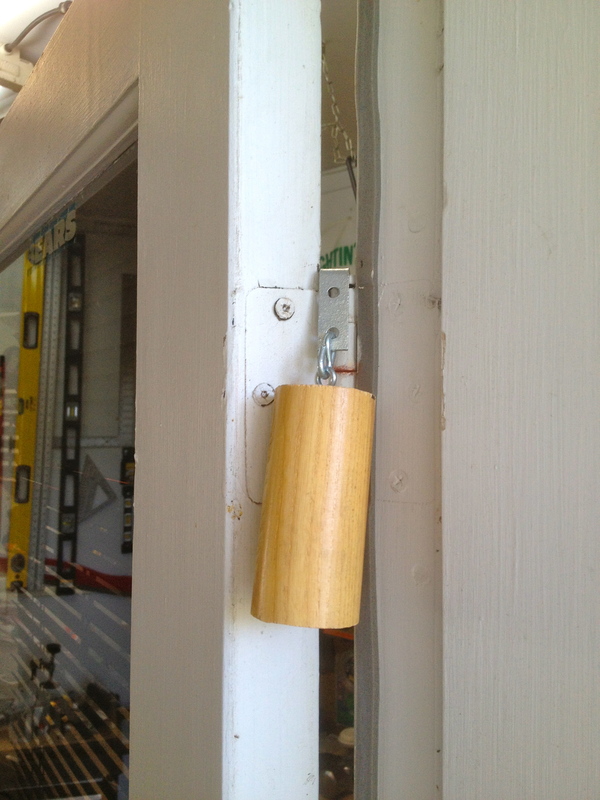 Just don’t go over 2-inches nominal or you won’t get the wood between the door edge and the stop on the hinge side. I say this because when a standard residential door is open and a door stop is in place (the ones that are screwed into the trim around the base of the wall) you have about a 2-inch opening between the door edge and the door stop on the frame. Anything larger used as a chock will not sit in this space and prevent the door from being closed. If a door stop is not in place and the door is allowed to open all the way to the wall then obviously the size of the wood doesn’t matter so much and the hinge hook will still function as intended. The next step is too secure your hardware and tools. You will need; screw eyes, s-hooks, corner braces with pre-drilled holes, a 1/16″ drill bit, drill, two pair pliers/channel locks. I use the #212 eyes, 1″ s-hooks and 1 1/2″ corner braces depicted in the picture. 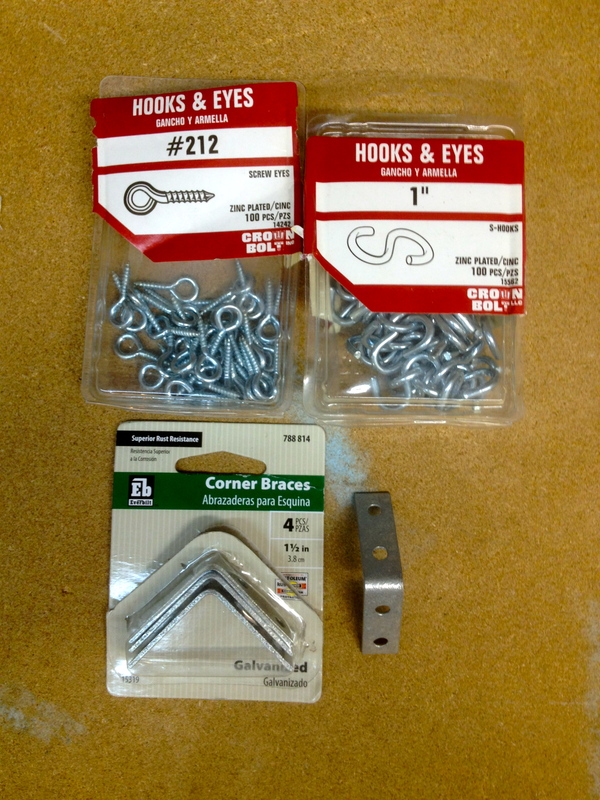 The bulk screw eyes and s-hooks come in 100 count packages and run about $4.50 at the local home improvement center. The corner braces don’t come in bulk that I have found and are, admittedly, the most expensive part of the whole thing. For the 4 piece package it’s also right around $4.50. 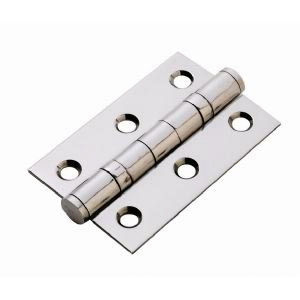 Maybe that’s where someone out there can improve on my idea and find a cheaper alternative to this part of the hinge hook. So next grab your tools. Pretty simple. Preferably a cordless drill. Couple pair of pliers or channel locks. And a 1/16″ drill bit if using the #212 acre eyes. If you choose to use a different size screw eye you will need to use a drill bit slightly smaller than the screw portion to drill the pilot hole. 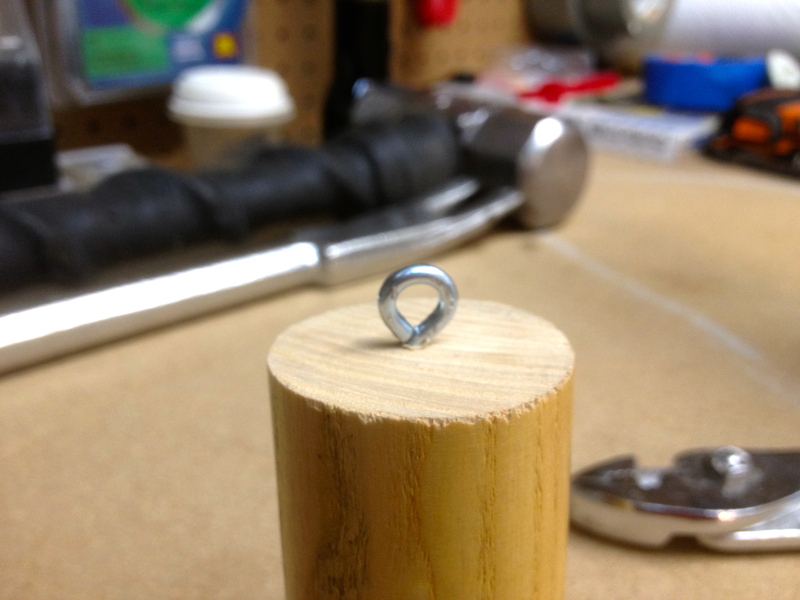 You are now ready to actually start building the hinge hook. Take the piece of wood you are going to use and place it on a stable surface with the flat surface down (I have to remember my audience IS firefighters). 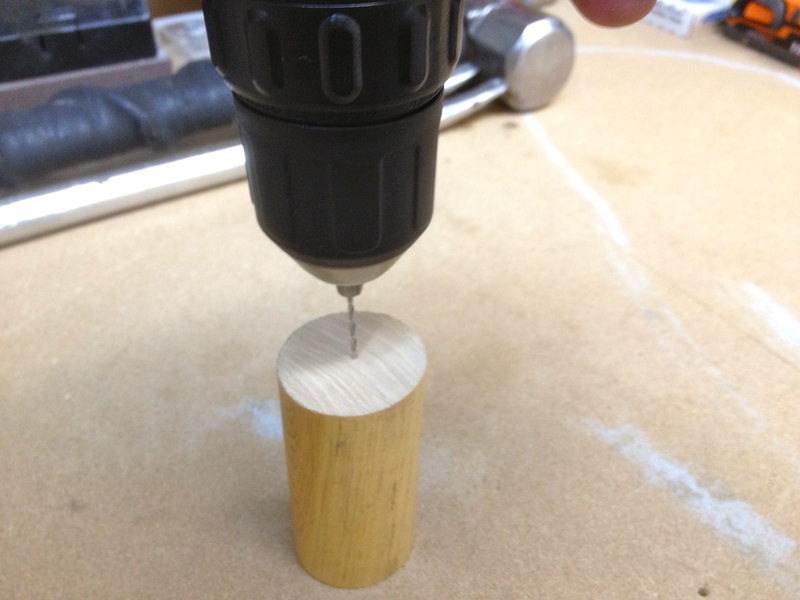 Place the drill bit in the center and drill a pilot hole. Try not to go too deep. You want to leave some virgin wood for the screw threads to bite into. Next, take your screw eye and place it into the pilot hole. Tightening it down until the base of the screw eye is flush with the piece of wood. 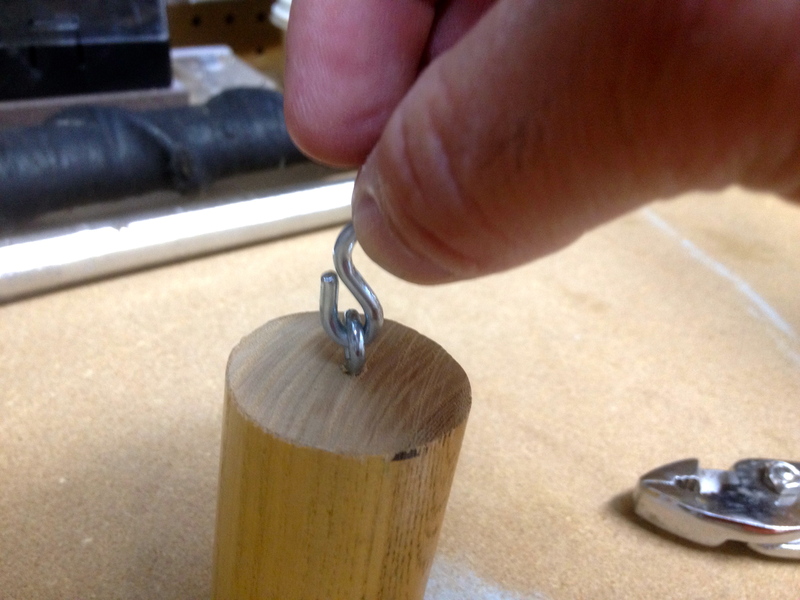 Now take your S-hook and place one of the ends through the screw eye. Once placed take a pair of your pliers or channel locks and pinch the S-hook closed. 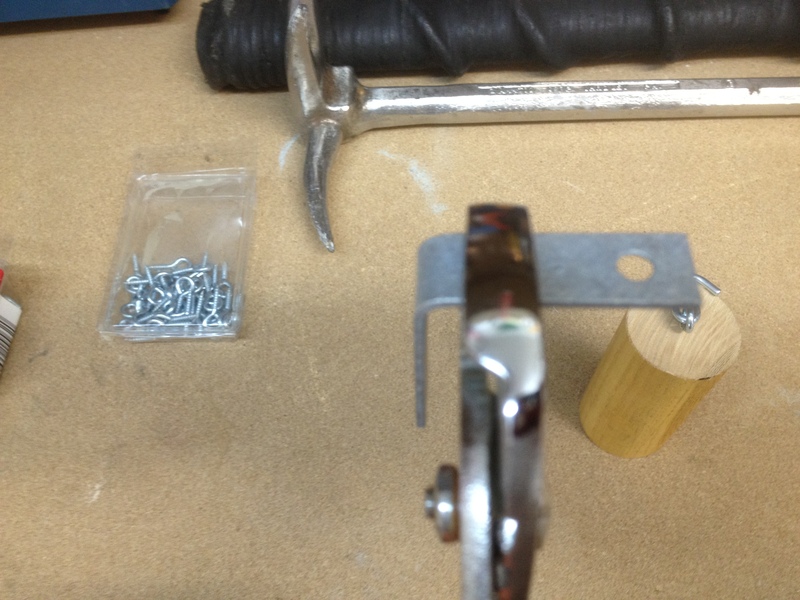 Next Take the corner brace and a pair of pliers or channel locks. Hold the corner brace with the pliers on hole closest to the bend in the brace. Next, place the other set of pliers over the other hole from the opposing direction. This makes it easier to bend the metal without getting in the way of the other tool. 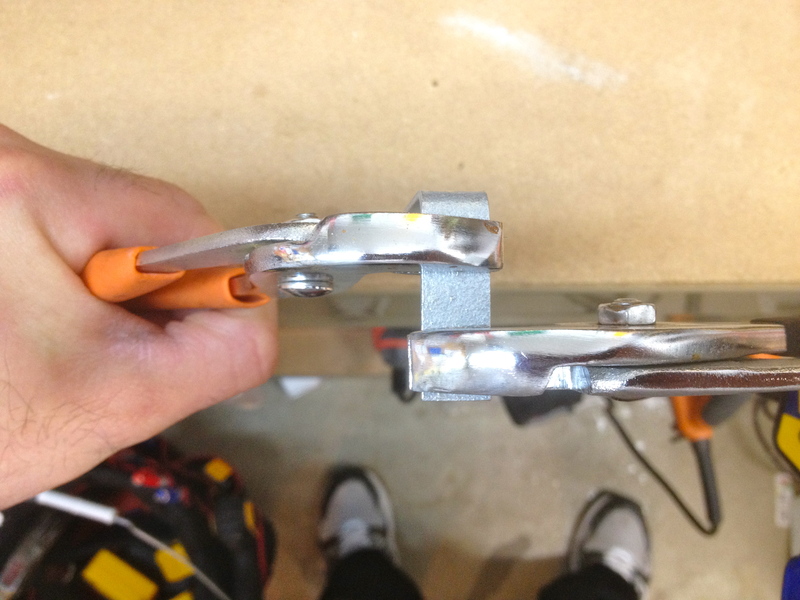 Using the second set of pliers, or the ones to the outside of the corner brace, bend downwards while holding steady on the inside set of pliers. 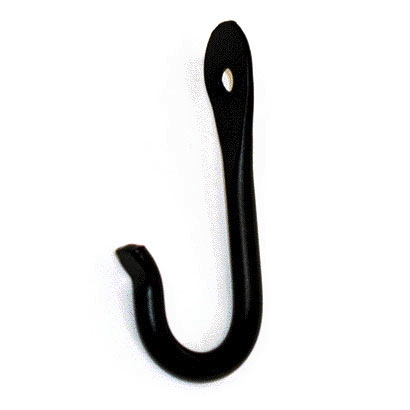 This will form a hook shape. Now you can attach the bottom hole of the straight leg of the corner brace to the open end of the S-hook and pinch closed as you did before. 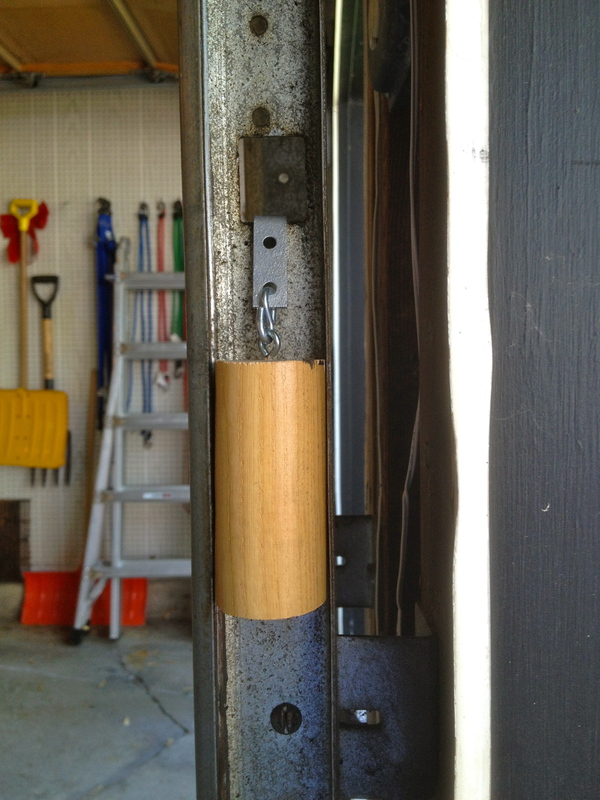 This is what the hinge hook looks like in place on a standard residential door. And in the track of a residential garage door. Congratulations! You’ve made your first HHH! Now pass it on to someone else. Just don’t go out and try to make money off it or I’ll use that hallway sledge and offer’s tool you saw in the background for something other than their intended purpose. Capiche? This is about helping each other and making things better, not about the Benjamins, yo. I made a short video of how I make these and posted it to YouTube and it can be found here. I also posted a short video of testing the hinge hook against a garage door because I had some guys voice concerns that it wouldn’t hold up. That video can be found on YouTube here. Give them both a look and see what you think. And as Andy Fredericks would say, “Research, research, research.” If you think you can improve upon this I’d love to see your ideas. If you think you have something better, send them in and I’ll try and post them. It’s about sharing, folks, so everyone benefits. Until next time. Happy researching. 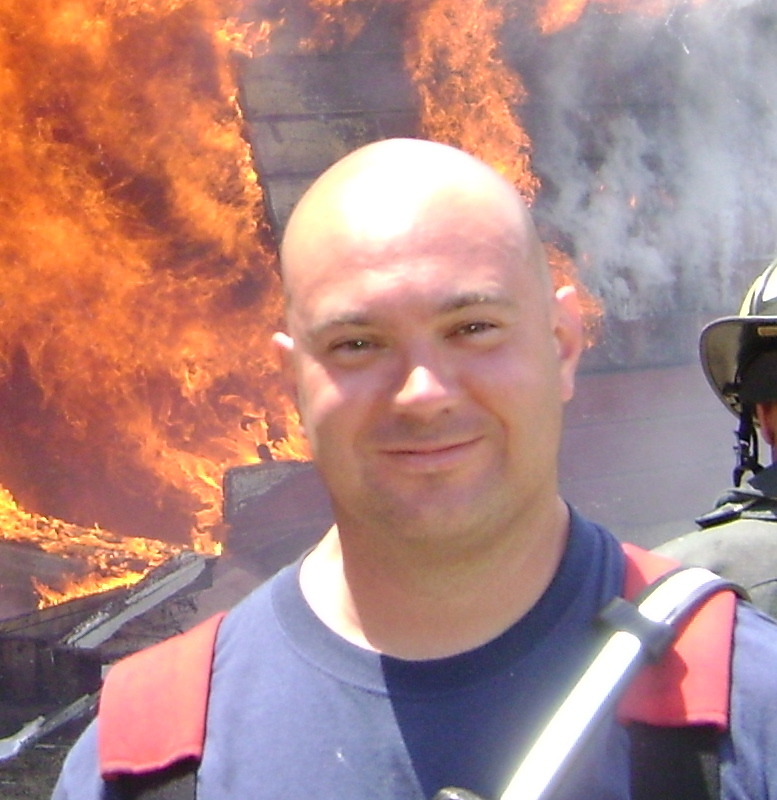 This entry was posted in Professional and tagged Andy Fredericks, Chris Sterricker, Door Chocks, Fire Department Training, Firefighter Training, Hallway Sledge, Hinge Hooks. If you have a local IKEA, they have awesome S hooks that would work for this application, and skip the need for the corner piece. They are about 3.5 inches long, and if you used a slightly bigger eye and just closed the S hook on it, you’d be skipping a step in your hook. Very cool idea! Sweet Dana. I have one very close to me. I’ll have to check them out. Thanks for the input!